15 Years ago I stumbled upon a little know London chef who would go onto make some of my favourite TV programmes and write critically acclaimed, voluminous books that would change many people’s conceptions of not only cooking, but the food industry in general. It was a Sunday afternoon of nondescript televised drivel that had me endlessly flicking from one station to the next like a child at the pick and mix. such options paralysis can never lead to any good in my opinion, however via this infuriating method I happened upon a scruffy looking middle class urchin! Pierre Koffmann is a legendary French Chef who came to the Uk in 1970. He came, with the sole intention of attending the England – France game at Twickenham, then, He planned to travel the Uk before returning to France. He never went home! 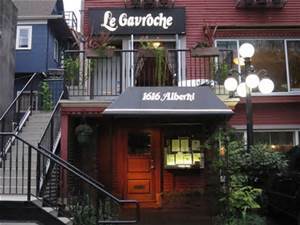 “La Gavroche” in Mayfair London. He stayed there until in 1972 before the Roux Brothers convinced Him to move to their new restaurant “The Waterfront” in Bray Berkshire. Koffmann was quickly elevated to 1st head chef at ” The Waterfront ” were He also met Manageress Annie whom He later married. 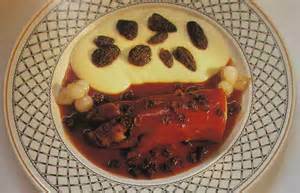 ( that French Accent, Mmmm ) It was at “The Waterfront ” that Koffmann began experimenting with Pigs Trotters and the various ways they could be prepared, from simply simmering in a mirepoix ( chopped vegetables) too much more elaborate concoctions that we will admire later. In 1977 Koffmann branched out and decided to open His own Restaurant ” La Tante Clare ” in Chelsea. It’s here He worked with Marcus Wareing, Gordon Ramsey, Tom Kitchin and Marco Pierre White. It was at this establishment that Marco Pierre White (MPW) began to forge a keen fascination with His own career. Koffmann Had always had a tempestuous relationship with MPW but respected him immensely has a great innovative chef! (MPW) arrived in london from Leeds has a 16 year old with a yearning for knowledge but an attitude of a god like prima donna. It is the work of MPW that inspires me more than any other Chef. He is the quintessential ” Enfant terrible” He would smoke in His kitchen, personally evict pretentious diners and vehemently conclude that His views were unequivocally correct! He once charged a customer £20 for a portion of hand cut chips. A legend was born! It was whilst Late night perusing of YouTube ( white wine in hand) that I first saw MPW in His kitchen, the Kitchen of His first restaurant, ” Harveys” on the edge of wandsworth common London. It was here that He won His 3 Michelin stars aged 33, at the time the youngest in the world and also the first British Chef to receive the accolade. Massimiliano Alajmo is now the holder of the title of youngest chef (28) to be awarded with 3 Michelin stars. In 1988 Marco made a television programme named ” Take 5 Chefs” in which he was challenged to cook his favourite meals for the 4 leading chefs in Britain. He cooked for Nico Ladenis, Raymond Blanc, Albert Roux and Pierre Koffmann. It was his preparation of The pigs Trotter dish, served to Raymond Blanc that grabbed My attention, watching him gracefully deal with such an unglamorous piece of bone, sinew and skin was almost poetic. My attempts to recreate “Pigs Trotter Pierre Koffmann” have been both numerous and frustrating, the list of ingredients is intimidating and expensive, but, whenever my pocket is swelled by cash from a little overtime at work I track down and purchase the required items and prepare to spend 6 hours in the kitchen. oil for frying ( simple oil is best) has olive oil loses its flavour when used for frying!! Tracking down all the ingredients was at times very frustrating. The trotters have to be intact as the flesh contracts when cooked and the filling simply oozes out, rather like a sausage that bursts when fried at too high a temperature. The Sweetbreads had to be ordered from a butcher in Aberdeen and with the delivery charge cost a small fortune. The butcher I used was John Davidson http://www.johndavidsons.com/ I highly recommend John Davidson’s butchers as the produce I received was outstanding. The morels are very expensive as they cannot be cultivated so are only hand-picked when in season, the 40g-50g required for this dish cost me £9 from Sainsbury’s world food section, alas they don’t stock them now…. My first attempts at this dish were abject failures but now I have the method down to a tee. Firstly the trotters need to be soaked in several changes of cold water, this cleans and also tenderizes the flesh, next they are singed with a blow torch to remove the small hairs that abound, then the tricky bit. The trotters need to be de-boned, this requires a sharp pointed knife and a steady strong hand, and is best done without a hangover from Friday night on the lash…….!. when the bone as been removed the trotter can be set aside. Trying to explain the de-boning procedure is quite pointless as it needs to be observed. Youtube has many examples of the method employed. https://youtu.be/bOA53yS3bTI This link shows Pierre Koffmann himself removing the bone from a trotter. Now, in a large casserole fry the Celery, carrot and onion for 10 minutes and then add the wine, stock, thyme, bay leaf and seasoning. When the stock and wine are simmering the trotters are added. next we place a tight fitting lid on the casserole and cook for 3 hours at 150c. Not My hand nor indeed Me! Whilst the trotters are simmering soak the sweetbreads in cold water for 2 hours. When soaked remove them and plunge them into boiling salted water for 10 minutes, pat them dry and fry them in very hot oil so the surface of the meat is caramelised, remove and allow to cool. Soak the dried Morels for 30 minutes in cold water then drain them. slice the morels into 1/2 inch strips and gently fry until coloured, again, allow these to cool. Now gently fry the onions and set aside when translucent, allow to cool. Place the chicken into a food processor and process for 1 minute then add the mace, tarragon ,egg and salt and process again for 1 minute. Next slowly add the cream in a thin stream to avoid splitting. Refrigerate the mousse for at least 1 hour. Now, combine the Sweetbreads, fried onions and morels with the chicken mousse and set aside until the Trotters are cooked. 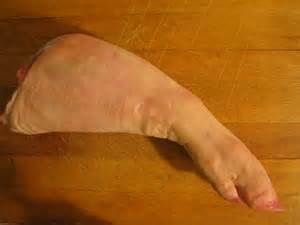 Once the Trotters are cooked gently lift them from the casserole and carefully place them onto a wire rack to cool. At this point the Trotters will be oak brown and meltingly tender. When the Trotters are cool they can be stuffed with the pre-prepared stuffing of chicken Mousse, onions, morels and sweetbreads. After filling the trotters are placed on buttered tin foil and tightly wrapped and refridgerated for 2 hours or overnight. Has with so many French dishes this sauce is a rich dark gravy of the most subtle exquisiteness. Start by frying the chicken legs until deeply coloured and then add the mushrooms and shallots, continue to fry for 3 minutes. Now deglaze with the Sherry vinegar, cognac and Madeira. Note: Deglazing means to add alcoholic liquid to a pan were it is boiled until reduced and the flavours of the pan are lifted into the liquid. Next add the Chicken stock, morels, bay leaf, garlic and thyme. Cover with a tight fitting lid and simmer for 20 minutes. Next strain the sauce through a fine muslin cloth 3 times to remove all solids. Place the sauce into a clean sauce pan and reduce by boiling until thickened, season and add a few drops of cream and lemon juice (tasting all the time) until you have a balanced sauce. The trotter now needs to be re-heated. This is done by simply poaching in simmering water for 20 minutes. In the meantime the sauce should be kept warm over a gentle heat and some mashed potato can be prepared. Mashed potato is mashed potato, I wont get pretentious about this just make it how you like it. Gently fry the Button onions for 5 minutes and then add the morels that were used in the sauce.Unwrap the trotters and sit in the top half of 6 warmed plates. pile the mashed potato onto the bottom half of the plate and spoon the sauce over the trotters. Place the button onions in piles either side of the plate and spoon the sauce over the trotters. finally garnish the trotters with the warmed morels.